Photo tours in Iceland, led by Patrick Dieudonné, professional photographer, in partnership with 66° Nord, a french travel agency specialized in polar regions. NB: Small groups of 4-6 photographers max. (+ guide) on this trip. Note: this Iceland in winter photo tour tour is open to all nationalities. I speak french and english and will be happy to welcome not just french-speaking photographers but english-speaking ones too in the same group. We can assist in your flights bookings, do not hesitate to ask ! A trip to Iceland is an experience like no other. The landscapes are in their own class, immediately recognizable. If you have already visited Iceland in summer, you will be amazed at how it changes with the seasons, and winter is of course the very best time to visit this polar region ! Iceland is characterized by its active volcanism: this land, settled for only a thousand years, offers in fact some of the youngest landscapes on earth, with tormented and contrasting features. Throughout this photo tour we will learn how to handle the peculiarities of landscape photography in Iceland, offfering quite strong contrasts between dark volcanic ash and bright skyes (use of graduated grey filters). Panoramic photography (stitched panoramic) is also a great way to do justice to the scale of Iceland wilderness, sometimes too cramped in the classic 2/3 format. 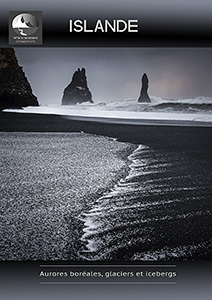 Photo tours in Iceland, in french and english by Patrick Dieudonné, professional photographer. Day 1 Arrival at Keflavik airport; Visit of Reykjanes peninsula, Reykjanesviti, Blue lagoon if possible. Night photography if possible. Day 2 The "Golden Circle", Thingvellir National Park in the morning, Oxarafoss waterfall, then the famous site of Geysir, and beautiful and mighty waterfall Gulfs, etc. - Overnight in Geyser area (hotel or B & B). Day 3 Seljalandsfoss and Skogafoss waterfalls between Hella and Vik, Hekla volcano. Night in the village of Vik itself, a very picturesque one. Day 4 Morning photography at Vik (Reynisfjara, Reynisdrangar), then drive to Skaftafell National Park. En route, we’ll be crossing the vast lava fields of Eldrhaun, the result of Laki’s historic eruption in the eighteenth century, a catastrophic event for Iceland. In the evening, photography in Skaftafell NP area (large glaciers, moraines and moors, colorful dwarf birch and vegetation). Night near Skaftafell National Park. Day 5 Morning and early afternoon in the park of Skaftafell for Svartifoss waterfall and/or glaciers nearby. Then Jokulsarlon, magnificent glacial lagoon. Night near Jokulsarlon, hoping for clear skies and auroras. Day 6 Early morning at Jökulsarlon, on the lagoon itself or on the black sand beach nearby, where small icebergs break into pieces, if the tide is right. Jokulsarlon, magnificent glacial lagoon. In the afternoon, photography near Höfn, in beautiful surroundings. Night at Höfn. Day 7 Another chance at Jokulsarlon if necessary, then drive to our starting point along the south coast. The drive is long enough and will not allow long photo sessions as the previous days. But it still offers a second chance on several sites, if the light is good. Night at Reykjavik. Night photography if possible. Day 8 Early morning departure (depending of flight times). • Land transportation (4x4 vehicle). • Alcoholic beverages and items of personal nature. • Stable tripod, ball head, etc. • Lenses for landscape: a wide-angle (below 24 mm), a transstandard 24 or 28-70 mm, a medium telephoto zoom lens (70-200). A longer focal length can sometimes be useful for details (300 mm). For more tips download our technical brochure below. A good level of fitness is required.This trip in winter to Iceland is more physically demanding than our other trips. In Iceland, breaks at the hotel are usually not feasible and the days are long. Walks of moderate level are possible. You should therefore be able to adapt to these conditions and be in good general fitness for a duration of 8 -9 days. Clothing: The climate in Iceland in winter can be difficult. So take windproof and breathable Goretex and layers of warmer clothes. Woolen hats and gloves, waterproof and breathable pants. We will not walk long distances with equipment. However access to the best views suppose access walks and exploration. You must be physically fit and able to carry your gear and tripod for a few hours. Bring good walking shoes (all leather shoes are recommended), a pair of gaiters can be useful. • Meals: When we are at the hotel or B & B, breakfasts and dinners are taken on site or nearby (restaurants, etc.). Lunch generally in small restaurants on the road. • Transportation: We'll use a 4x4 hired car. Please try wherever possible to limit the size of suitcases, for comfort on board. Pre-booking on this site (please use the form above), then we will arrange booking deposit and final payment with our partner 66° Nord. Not included. We can assist you, providing hours of arrival and departure, and helping you in your flight bookings. Just ask and we'll help you. Contact us using the form above or call if you need further information.Thank you.